Many times people ask why we live in Bahrain, and by extension the Middle East. In Bahrain we get Free Hugs. All people from the Gulf countries are very warm and affectionate with their families and friends. When Arabs greet each other, it is not a simple “HI”. There is an entire ritual of multiple hugs and kisses while asking about the family’s well-being. When I offer my hug and kiss to a friend, it looks anti-social compared to theirs. But in Bahrain, that love extends beyond the family to the other people visiting and living on the island. Ulafaa (meaning partners), an artist-led group, gave out Free Hugs during the Market 338 last month. 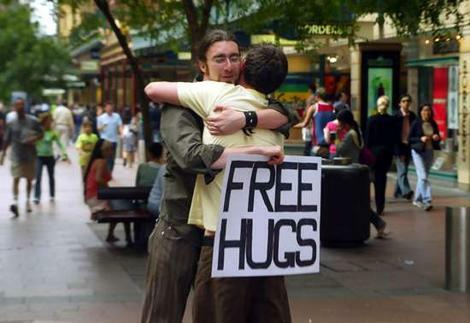 The Free Hugs campaign began in 2002 when Juan Mann started hugging strangers on Sydney’s street. Helped by the Sick Puppies song and video, Free Hugs has gone global. As I look through the Free Hug photos and videos from around the world, I think Bahrain was the first country in the Gulf, if not the Middle East where Free Hugs were given out. A tiny drop of hope from Paradise that inshallah will radiate throughout the Middle East. Good ideas do spread. It is true that one person can be the creative force for positive change.